If you want to go for a fishing expedition without a life vest or jacket, that does mean you are insecure in the water. Because you can’t make sure there won’t happen any accident, because the condition of the ocean or stream will not be always same. So to be safe from drowning or any accident in the water you must wear a life jacket. When you have a life jacket in the water, no matter how dangerous the condition of water, at least you can be confident that you won’t be drowned under the water if you fall down from the kayak, boat or canoe. Actually the weather of the ocean can be changed anytime and there would have probability of facing the big waves. So to beat any unfair condition of the water and safely back on the shore you must wear a life jacket. The Onyx Kayak Fishing is originally designed to give a complete support for angling. The jacket isn’t only a thing that just will keep you up in the water, but also it has separate pockets that are suitable for holding the tackle box, fly fishing reel, fishing line and other very needed accessories. It has also the lash tabs that are helpful for holding your knife and whistle. Literally the level of ability to store multiple items of fishing of this jacket is surprising what actually an angler wants. 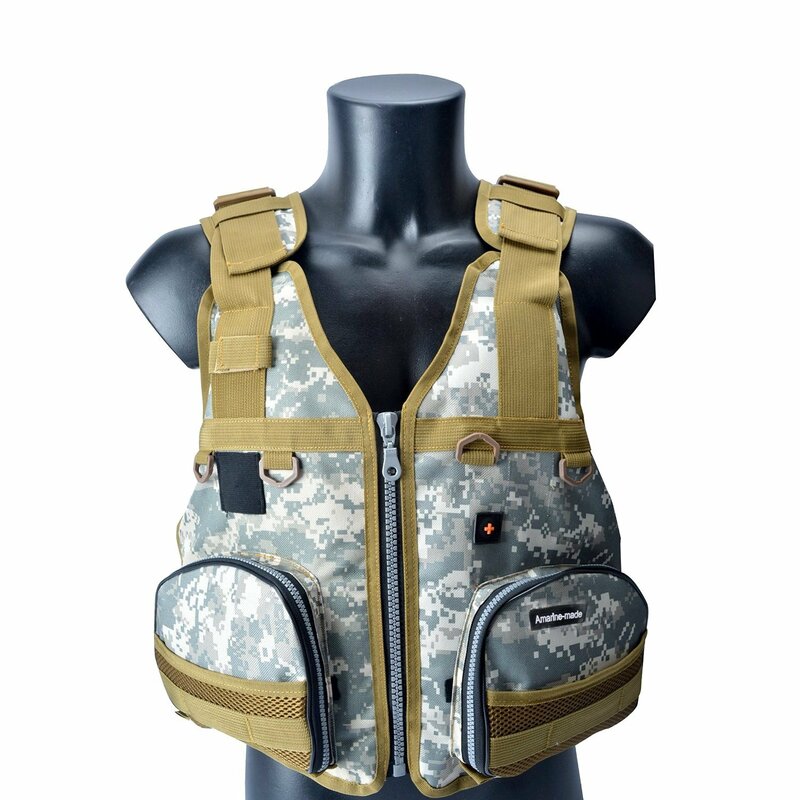 Moreover, you need perfect comfort on the different kind of activities of fishing or kayaking. That’s why up it or down or tight up by six adjustable straps. Even when you are wearing this jacket you can enjoy the extreme reliability because of the mesh covered inside. It will keep the inside cold and air breathable. 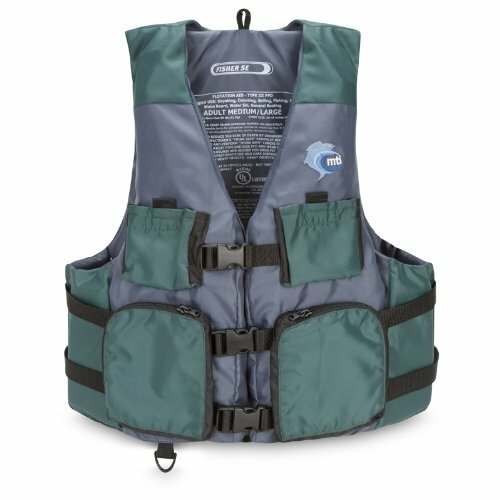 I would recommend this life jacket for those guys who can’t exceed their limited budget. But don’t worry about the quality and its ability to protect you from drowning. 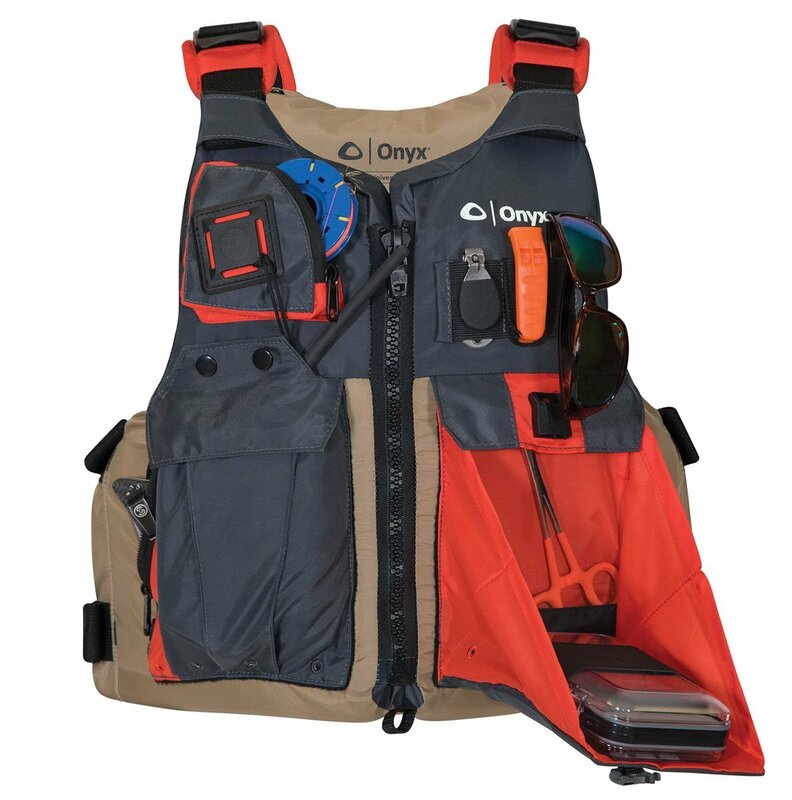 This life vest is composed of few high quality materials like 600D Max Waterproof Terylene Oxford and EPE foam for a perfect combination. On the other hand it is able to hold any guy on the water who weighs under 110 kgs. The straps with buckles on the jacket will let you to easily tighten up or down with the body while the crotch straps would prevent it from pulling up and off the body. That’s why enjoy the kayaking or fishing expedition confidently with wearing this jacket. And finally the multi pockets on the jacket are great for angling as they can hold lots of items. It comes from MTI Adventurewear and with 4 pockets in front of the jacket it is fully designed with a great usability for angling. The pockets of the jacket especially those are on the lower part have ample space that can be simply used for fishing necessities while the D-rings on the front and back of the jacket are great for attaching some additional and necessary gears. You can easily get the jacket in your body with enough fittings as the buckles on the center are connected with shoulder straps that can be used for easily tightening up. With fishing on the ocean, river or stream It is suitable for multiple activities in the water. The Stohlquist Fisherman Personal Floatation Device has been designed for an adventurous fishing expedition as it can give a powerful flotation service on the rough condition. To ensure that your body will be top of the water it used 500 denier Cordura shell and has the 200 denier oxford liner that not only make this jacket ultra sturdy, but also can keep superiorly raised your body up on the water. The jacket also comes with several ample pockets, one is on the backside and twos are on the front. These pockets are undoubtedly useful for keeping fishing accessories while the lash tabs are great for holding some very needed handy accessories like nippers and pliers. Actually, this is a safe way for carrying the accessories without any possibility of losing them. Like the other jackets of the list it also comes with adjustable shoulder straps for an excellent adjustment. 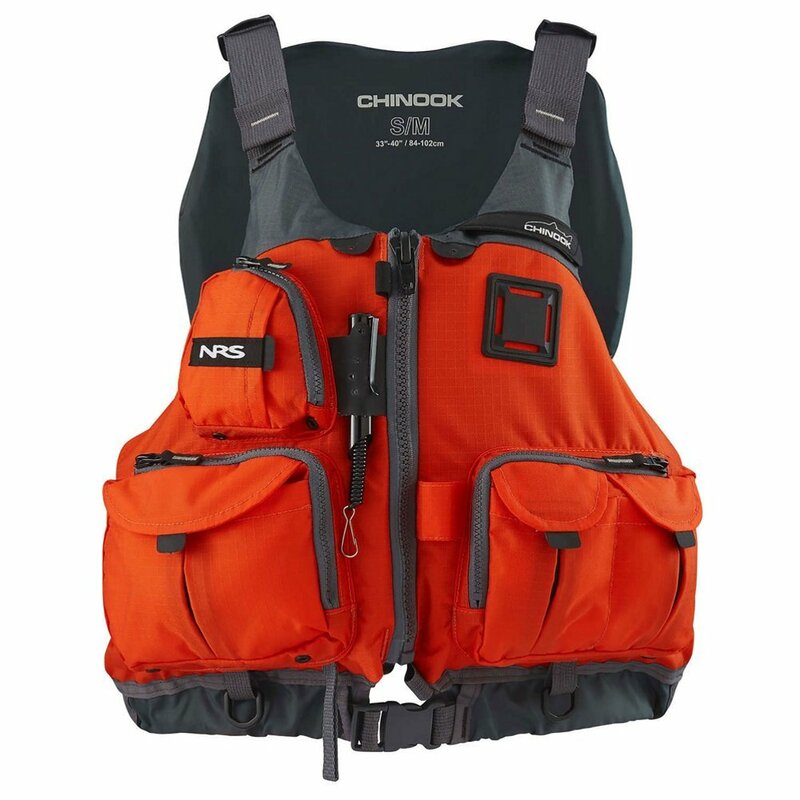 The NRS Chinook Mesh Back Fishing PFD features 7 front pockets including two large and several mini pockets as if you can carry everything like the tackle boxes, nippers, fishing lines, retractors and fishing pliers for a fishing trip. The 8 adjustment points on the jacket let you to tighten up the straps properly until it fits with your body. It is designed for the extreme comfortability as the Soft PlushFIT foam on it will ensure that you will enjoy an unsurpassed comfort. Moreover, it not only ended up by adding few D-rings and pockets, but also the coil tool retractor on the jacket is great for clipping the additional tool. As well, the mesh lower back on the jacket is also great to keep you warm and protect you from sweats. The girl who is interested in kayak fishing, then this Stohlquist Women’s Flo Jacket is for you. In front of the jacket it has two large pockets for safely holding the some mini gears you need for fishing while this versatile life jacket is great for several kinds of activities you want to enjoy in the water. It is crafted with the mesh in inside and the back of the jacket has a peat with mesh. Such a great craftsmanship ensures a superior air breathability for your body. For a perfect flotation it uses denier ripstop shell and oxford liner and PE foam, that not only has greater ability for flotation, but also can provide the coolness and comfortability for your body. You would go wrong with a faulty life jacket in the circumstance of drowning or swimming. 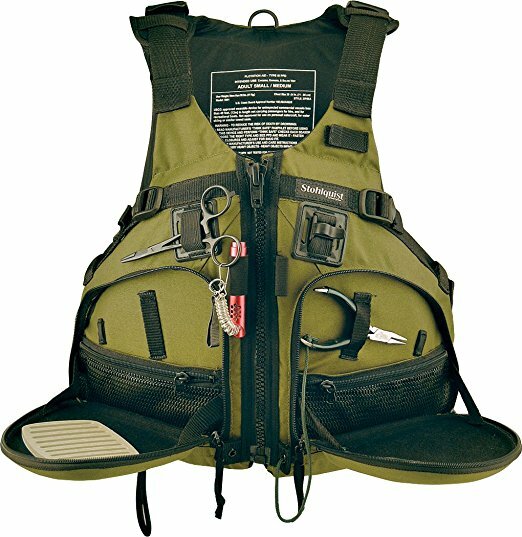 So before picking your life jacket, make sure it will work as a true life saver and actually having some ideas over these points can help you a lot. Having the pockets on an ordinary jacket may not important, but when you are choosing a life jacket for fishing, then it must have several pockets to hold the tackle box, fishing reel, fishing line, nippers, pliers and knife. So you can get these handy tools in your very near and if the jacket has D-rings, lash or retractor, then these things would work helpfully from a side to reach the tools in your hand very quickly without losing them. That’s why make sure your jacket at least includes two ample pockets while having the D-rings, lash and retractor is plus. Fitting a life jacket perfectly to your body is another requirement. Because wearing a loose jacket isn’t comfortable and it can create some problem when you try to swim with it. In this case even you can lose your jacket in the water that would be very unfair. So the straps with buckles on the shoulder and waist would help you to properly tighten up until it is fitting well with your body. That’s why, make sure you got the jacket with adjustable straps. From a research it has been proved the jackets with coast guard approved work more successfully than the jackets with non-coast guard approved. Because these manufacturers always go through the testing of their products by the water life experts. They test the quality and ability of the jackets for keeping you up on the water and approved it. So you must ensure that you have the jacket that is coast guard approved. When you wear a life jacket, you don’t expect that would be a reason of uncomfortability. That’s why the mesh on the life jacket actually can increase the air breathability and protect you from the sweats. When you are going for a fishing hunt on a sunny day, this feature of the jacket would keep you cool and dry and can prolong your fishing time. 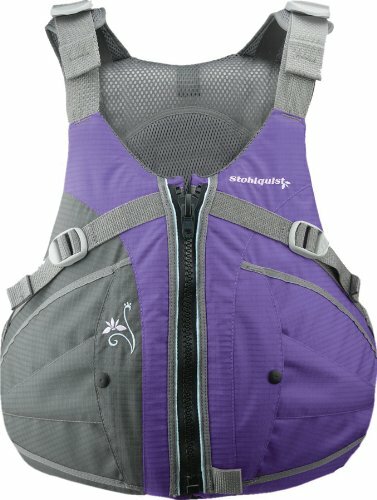 Honestly, these six best life jackets for kayaking have the right design and ability to protect you from any unfairness of the water while their specific features for the anglers and fisherman will provide a great advantage to carry and handle all their accessories. So any of the model of this list would provide lots of advantages for fishing and keep you ultimately safe from the unfairness.